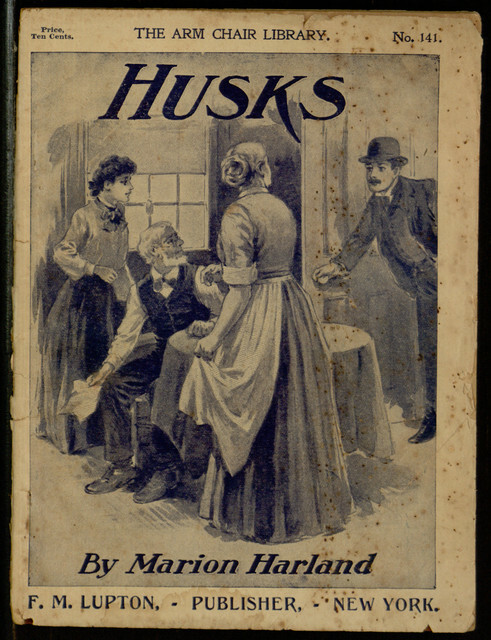 Our latest completed Distributed Proofreaders project is Husks, by Marion Harland (a pseudonym of Mary Virginia Terhune). This edition of the book comes from F. M. Lupton’s Arm Chair Library, the same series that provided our earlier release, Averil. Like that earlier title, Husks focuses on the inner lives of its characters rather than dime novel sensationalism, telling a sad tale of love gone horribly wrong. Of course, the tragedy is designed to offer some lessons to its readers, and the author is not always shy about editorializing on society’s wrongs. The modern reader is unlikely to agree with all of the author’s conclusions, but some of the situations remain resonant, and some of the authorial asides are, at least, amusing to read. The entire book is now available for online reading or download from Project Gutenberg.